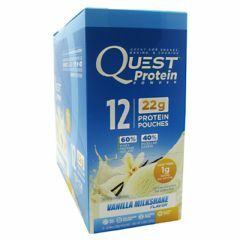 AllegroMedical.com presents The Quest Nutrition Quest Protein Powder - Vanilla Milkshake Protein Supplement Gluten Free. Great for shakes, baking & cooking. Less than 1g sugar per serving. No Soy. No Added Sugar. Gluten Free. Taste, Reimagined. Quest Protein Powder is a tasty, decadent blend. Even when it's simply mixed with water. We've transformed high quality protein into impossibly delicious flavors that are distinctly Quest. But we didn't stop there. Cheat Day, Everyday. Quest Protein Powder is a groundbreaking cooking companion for your favorite #CheatClean recipes. Ditch the junk for this perfect ingredient swap to turn a carb-heavy cheat into a protein-rich treat. Protein Per Calorie. Quest believes the greatest measure of a protein powder is its protein-to-calories percentage. The higher, the better. Quest Protein Powder has one of the highest percentages of any protein because we don't add any junk. It's just amazing taste and excellent nutrition. Protein Blend (Whey Protein Isolate, Micellar Casein), Natural Flavors, Contains less than 2% of the following: Cellulose Gum, Sunflower Lecithin, Steviol Glycosides (Stevia), Salt, Carrageenan, Sucralose.